Unlike other proprietary or most other open source ERP systems, iDempiere Business Suite is constantly developed and improved by a community of supporters. This means the software relies heavily on its community of developers, implementors, and end-users for its continued improvement, architectural design, documentation, code contributions, and financial support among others. iDempiere Business Suite ERP/CRM/SCM delivers an open-source business management system packed with all the goodness you expect from modern ERPs, CRMs, and SCMs in a single package. Under a single dynamic platform, you get a comprehensive ERP software to help you manage all facets of your business. There are so many reasons why many businesses and organizations pick iDempiere Business Suite to help them gain absolute control over their operations. Here are some of them. Being an open-source software, iDempiere Business Suite enables end-users such as yourself get involved with the platform’s development and growth. You can provide developers inputs from your end on how to further enhance or extend the software’s existing capabilities. Or you can submit suggestions for additional features based on your business requirements, standards, and preferences when they roll out the next version. 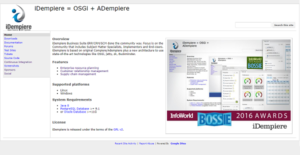 While you can provide the iDempiere Business Suite’s community of developers with a list of all the features you need or want, chances are the software already has them. Right from the get-go, iDempiere Business Suite is loaded with the majority of tools and functionalities you probably need to run and manage all your business operations. Whenever you need more capabilities, the software’s flexible and scalable design allows you to put in additional functionalities via integration and customization. Every company has different needs and requires an application that can be customized for their size, type of workers and clients, and the specific industry they are in. For these reasons, no system can proffer perfect functionality off-the-shelf. When you search a software product, first be sure what you require it for. Read some iDempiere reviews and ask yourself do you desire basic tools or do you require complex tools? Are there any industry-specific features that you are looking for? Find the answers to these queries to help your search. There are multiple elements that you need to mull over and these include your finances, specific business requirements, your organization size, integration needs etc. Take your time, check out a few free trials, and finally choose the system that provides all that you require to boost your firm competence and productivity. How Much Does iDempiere Cost? We realize that when you make a decision to buy ERP Software it’s important not only to see how experts evaluate it in their reviews, but also to find out if the real people and companies that buy it are actually satisfied with the product. That’s why we’ve created our behavior-based Customer Satisfaction Algorithm™ that gathers customer reviews, comments and iDempiere reviews across a wide range of social media sites. The data is then presented in an easy to digest form showing how many people had positive and negative experience with iDempiere. With that information at hand you should be equipped to make an informed buying decision that you won’t regret. What are iDempiere pricing details? What integrations are available for iDempiere? If you need more information about iDempiere or you simply have a question let us know what you need and we’ll forward your request directly to the vendor.